MULTAN (WebDesk) – Jamat-e-Islami (JI) chief Siraj-ul-Haq on Wednesday has said that we need to set an example for country’s enemies by sentencing India’s Research and Analysis Wing (RAW) agent Kulbhushan Jadhav. 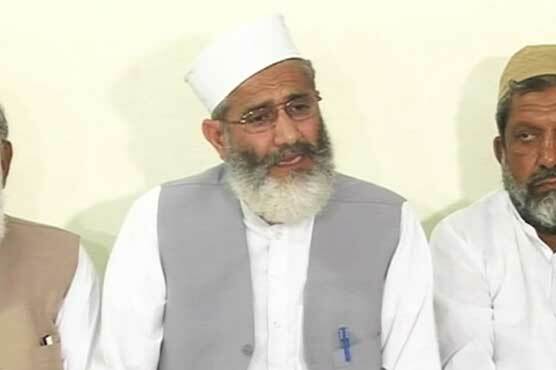 Addressing a press conference in Multan, Siraj-ul-Haq said that government’s stance on Kulbhushan Jadhav’s matter is still unclear. He said some of our politicians would definitely feed Jadhav with milk if they would have an authority. Responding to a question, JI chief said that the criminals should be treated under law regardless of their relation with any political party. He said if Uzair Baloch was not arrested then it was feared that he would be freed by political aides just like Dr Asim Hussain. Talking on Panama Leaks case, he said that the people are waiting for its verdict and said that there is no harm if 20,000 people are going to jail for the betterment of the whole nation but the decision has to be against the corruption. Shedding light on Syria issue, he said that super power battle is being fought in Syria after which Pakistan and Saudi Arabia will be the next victims. On the occasion, JI Chief strongly bashed incumbent government over not fulfilling the electoral promises. He said leaders have failed to provide relief to the general masses as they are busy in holding personal advertisement with the money of people.